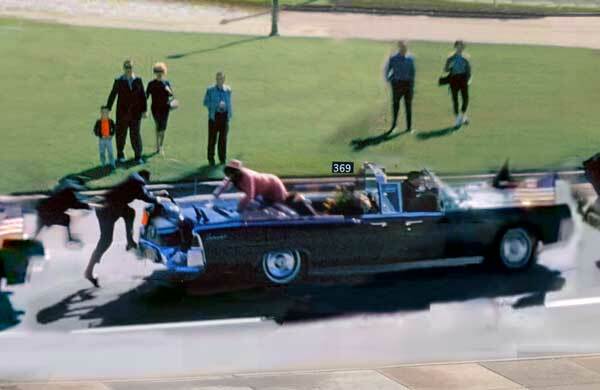 On Friday November 22, 1963 at 12:30pm, the President of the United States is assassinated in Dealy Plaza, Dallas, Texas during a campaign visit. 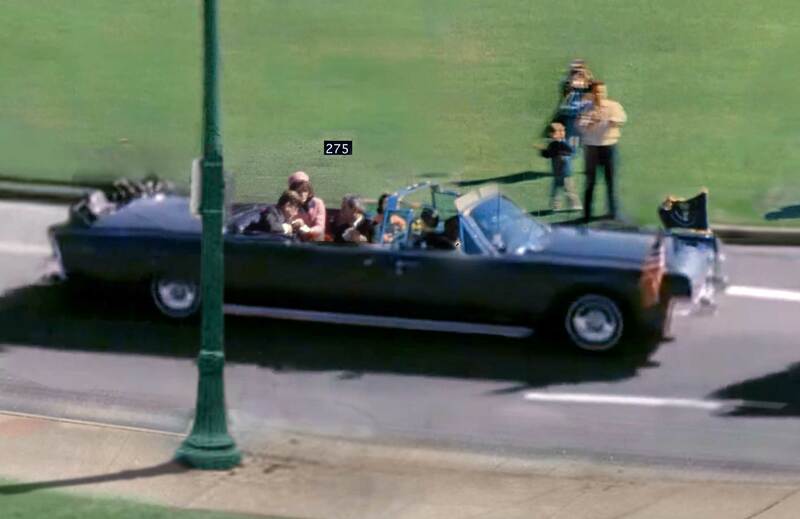 Texas Governor, John Connelly, riding in the jump seats, is also wounded from the gunfire. Combining extensive research with meticulous reconstructions, the narrative landscape is composed almost entirely from digitally manipulated film stills from footage shot by Abraham Zapruder, Mark Bell, Robert Hugh, George Jeffries, Mary Muchmore, Otto Nix as well from several colorized still photographs. The work is supplemented with a subsequent black and white FBI film reconstructions. 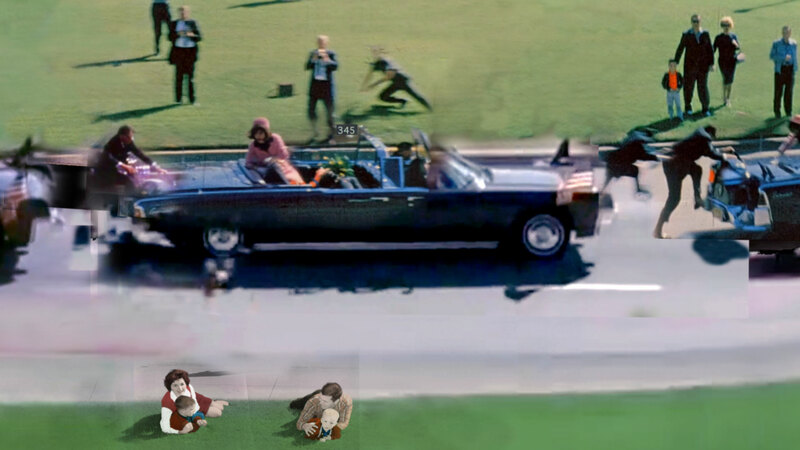 The Assassination of John F. Kennedy is part of a tetralogy of pivotal U.S. assassinations from the 1960's and includes Martin Luther King, Robert Kennedy and Malcolm X. 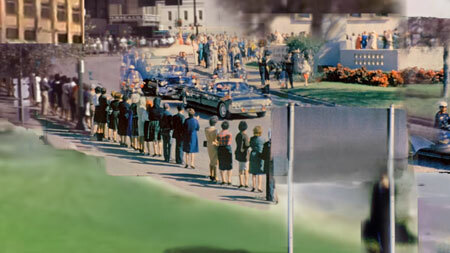 The Kennedy motorcade turns on to Elm St. moments before the first shot hits the president. The first shot to hit the president, he clutches his throat while Gov. Connolly is hit by either the same bullet or a second shot, according to Connolly's testimony. 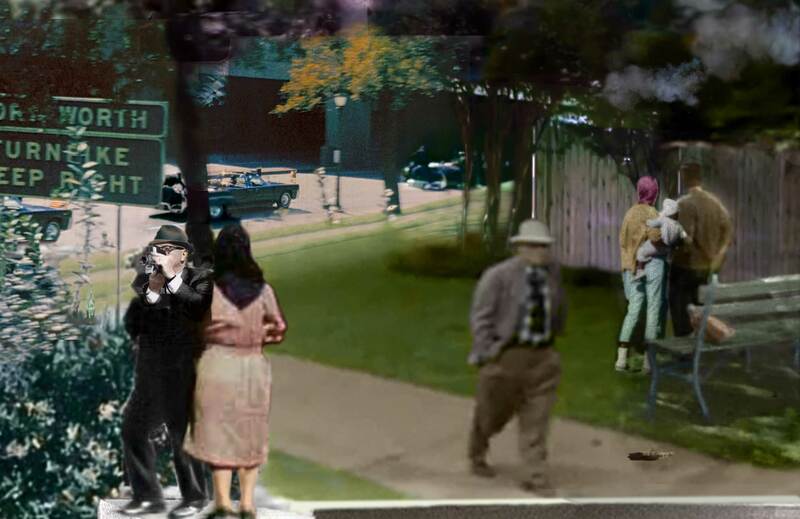 The "umbrella man" Louie Steven Witt, an unidentified waving man, "Dark Complected Man", and Cheryl McKinnon, a journalism student who reported seeing clouds of white smoke from the grassy knoll, stand close by. The first lady comforts the president while the unidentified"Babuska Lady" films close by behind Charles Brehm and his 5 year old son, Joe. Brehm, a WWII vet, has reported that a portion of the President's skull was driven back and sharply to the left, over the rear of the President's car and of hearing a third shot after the fatal head shot, although he was never called as a witness for the Warren Commission. 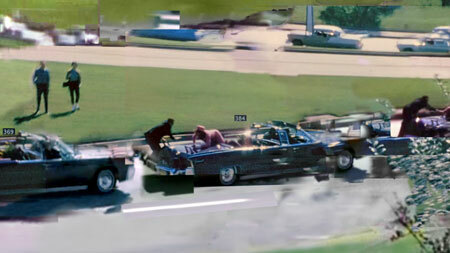 The fatal headshot, frame 313 of the Zapruder film with the two closest witnesses, Jean Hill and Mary Ann Mooreman. 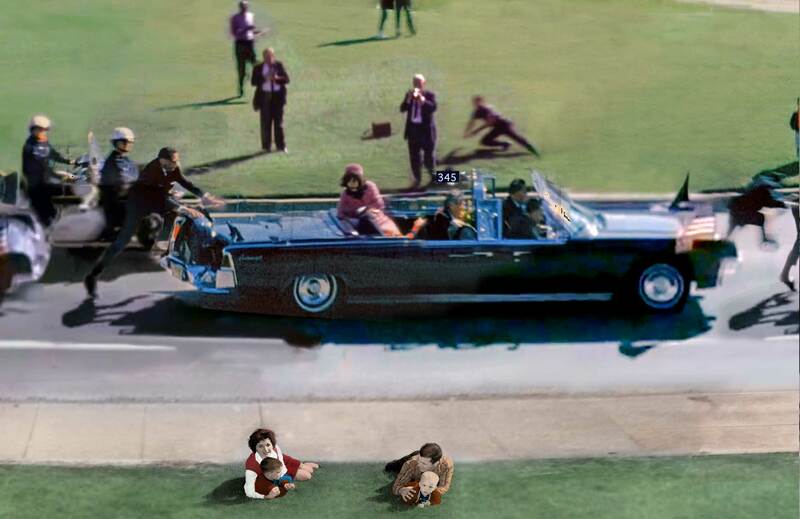 Mooreman, who was taking photographs, reported hearing Mrs. Kennedy cry out "My God he had been shot" as well as hearing 3-4 rapid shots. 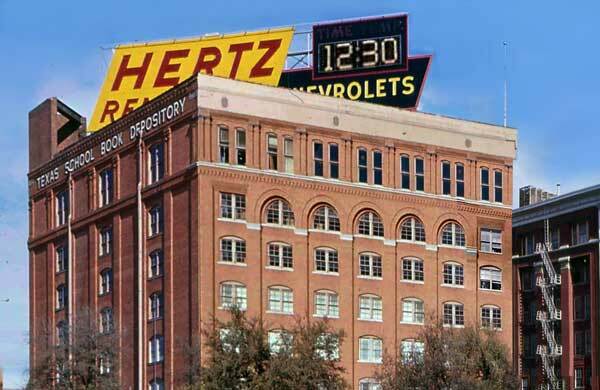 Hill has reported seeing a figure, possibly Jack Ruby, running from the Texas School Book Depository toward the picket fence area, and of seeing clouds of smoke from the grassy knoll. 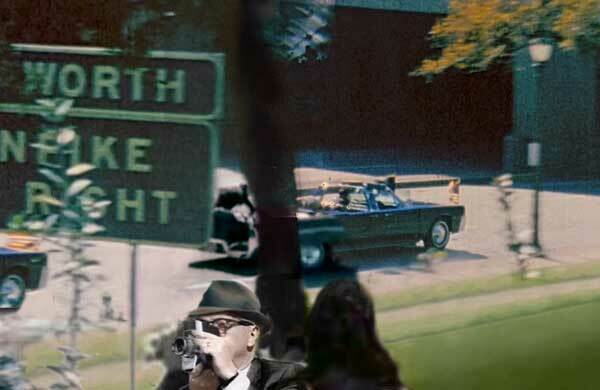 Mrs. Kennedy testified to the Warren Commision, "I was looking this way, to the left, and I heard these terrible noises. You know. And my husband never made any sound. So I turned to the right. And all I remember is seeing my husband, he had this sort of quizzical look on his face, and his hand was up, it must have been his left hand. And just as I turned and looked at him, I could see a piece of his skull and I remember it was flesh colored. I remember thinking he just looked as if he had a slight headache. And I just remember seeing that. No blood or anything. And then he sort of did this [indicating], put his hand to his forehead and fell in my lap. And then I just remember falling on him and saying, "Oh, no, no, no," I mean, "Oh, my God, they have shot my husband." And "I love you, Jack," I remember I was shouting. And just being down in the car with his head in my lap. 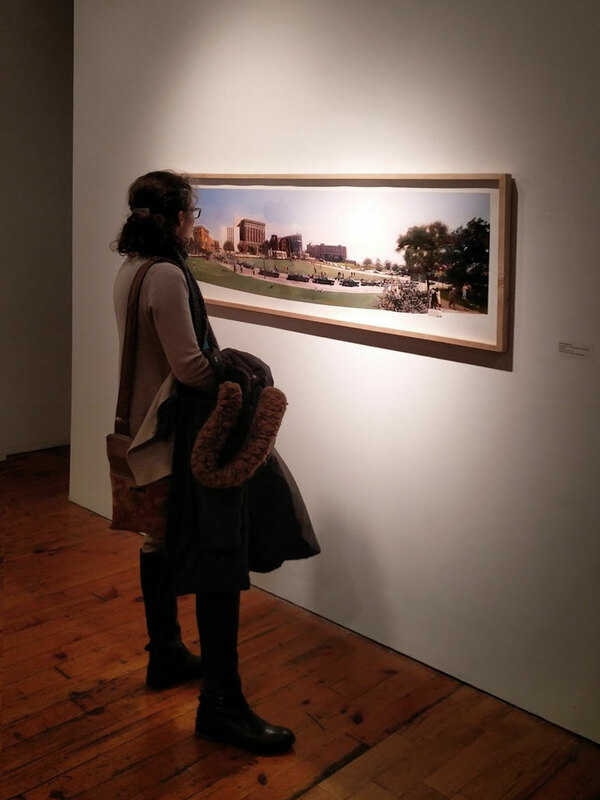 And it just seemed an eternity. You know, then, there were pictures later on of me climbing out the back. But I don't remember that at all. " 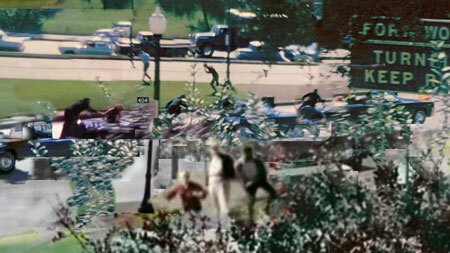 Frame 345 of the Zapruder film, background, Richard Bothun (a photographer, James W. “Ike” Altgens (an AP photographer) and, mid-dive police officer, Malcolm Summers; foreground the Newman family. 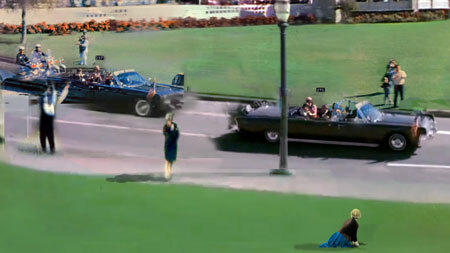 Frame 369 of the Zapruder film, Mrs. Kennedy climbs onto the trunk of the limousine to retrieve part of the president's sckull while security officer, Clint Hill, scrambles onto to the vehicle. Hill testified to hearing two shots from the right rear, "The second one had almost a double sound--as though you were standing against something metal and firing into it, and you hear both the sound of a gun going off and the sound of the cartridge hitting the metal place, which could have been caused probably by the hard surface of the head. But I am not sure that that is what caused it." Frame 384 of the Zapruder film, Mrs. Kennedy climbs onto the trunk of the limousine to retrieve part of the president's sckull while security officer, Clint Hill, scrambles onto to the vehicle. 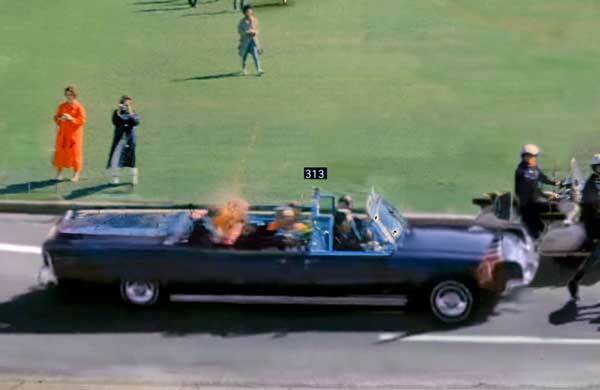 Hill testified to hearing two shots from the right rear, "The second one had almost a double sound--as though you were standing against something metal and firing into it, and you hear both the sound of a gun going off and the sound of the cartridge hitting the metal place, which could have been caused probably by the hard surface of the head. But I am not sure that that is what caused it." The presidential limousine speeds away toward the underpass and Memorial Parkland hospital. Commerce Street and an adjacent parking lot. 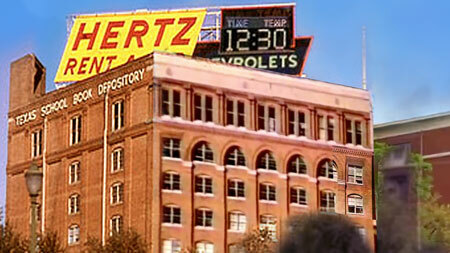 The Texas School Book Depository. 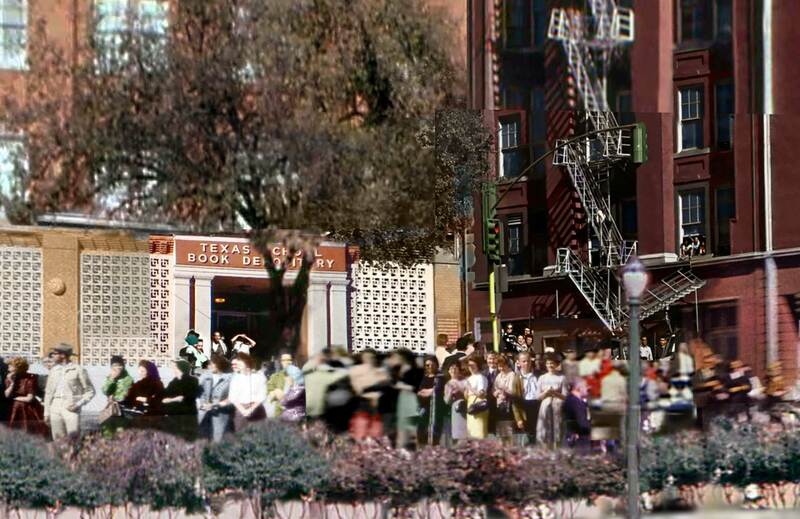 The Texas School Book Depository entrance, Billy Lovelady, often mistaken for Oswald, stands in the doorway. The Texas School Book Depository showing the open window on the 6th floor where Oswald is alleged to have fired the shots. 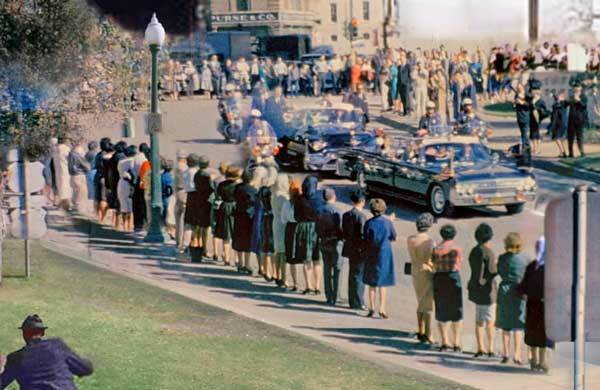 The President's limousine turns down Elm St. moments before the shooting begins. Frames 237 and 275 showing the president reaching for his throat after the first gunshot wound; Cheryl McKinnon, a journalism major, watches while Doris Mumford falls to the grass in a pose reminiscent of Wyeth's Christina's World. 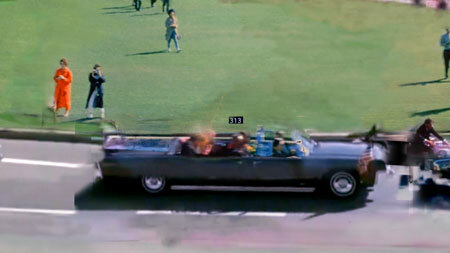 Frame 313 and the fatal head shot. 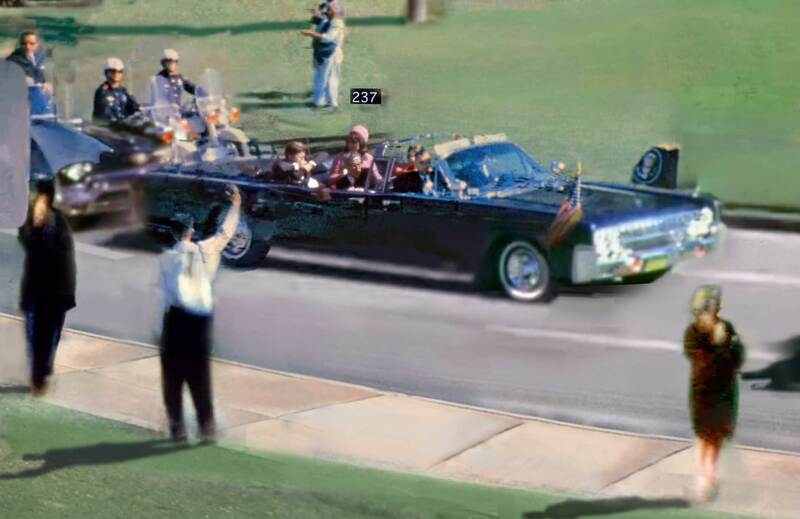 Secret Service agent Clint Hill struggles to get onboard while Jacqueline Kennedy gasps as fragments of the President’s skull are blown onto the trunk of their Lincoln Continental limousine. Background: photojournalist Ike Altgens, Officer Malcolm Summers Foreground: Bill and Gayle Newman & their 2 sons, Clayton, 2, and Bill, 4..
Jacqueline Kennedy, having retrieved fragments of the President's skull, slides back to her husband as their limousine speeds away. The Kennedy car speeds past the Forthworth Turnpike sign toward the Parkland Hospital. 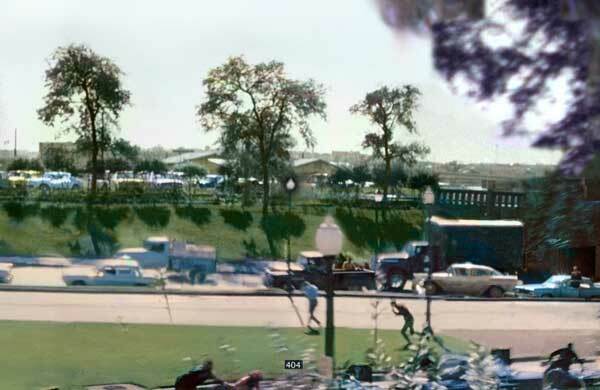 In the foreground, composites of Abraham Zapruder filming while his secretary, Marilyn Sitzman, supports him. 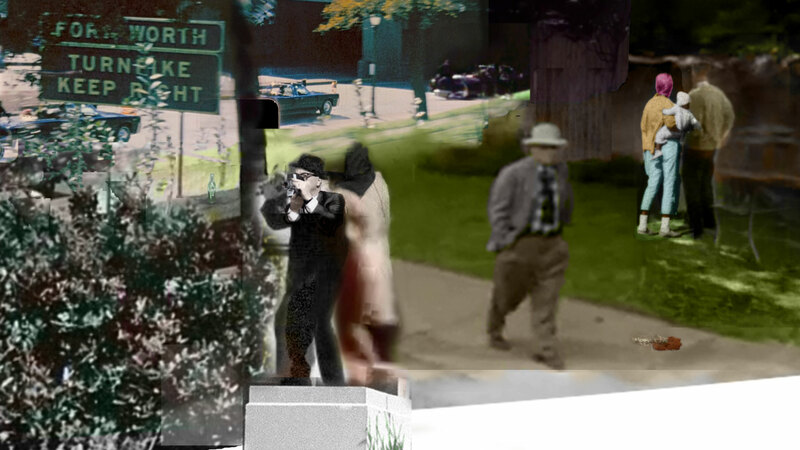 The man with the stetson hat walking away is from a later FBI film reconstruction and represents the conspiratorial elements of the assassination. 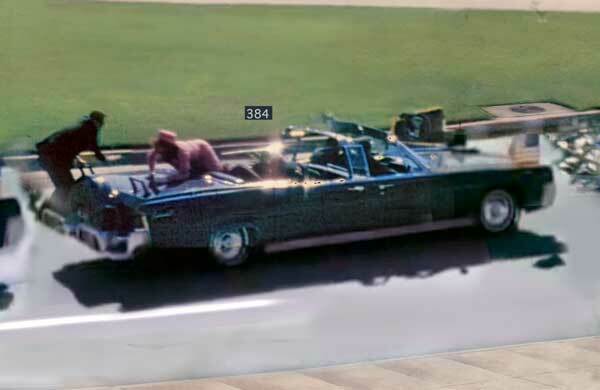 A young African-American couple who were never identified lunch on the grassy knoll and immediately flee breaking a Coke bottle.